The Windsor Public Library GOODREADS Online Book Club is a destination for readers which has been designed to help find and share the books you love. GOODREADS allows you to create a personal account and use it to track your reading activity. It also provides an opportunity to join a variety of book club groups for online discussions and interactions. The WPL group is open to the public and is 100 percent online – there are no meetings to attend. •	occasional polls, videos, pictures, and games intended to enhance your overall reading experience. If you’re already a member of GOODREADS all you have to do is join the WPL Group by visiting www.goodreads.com/group/show/104611-windsor-public-library. If you’re not already a GOODREADS member, you will need to create an account – which is free – at www.goodreads.com. You can create an account using an email address and password or join GOODREADS via Facebook, Twitter, or Google. Once you’ve registered, you are free to join the Windsor Public Library Group and any other groups that interest you. 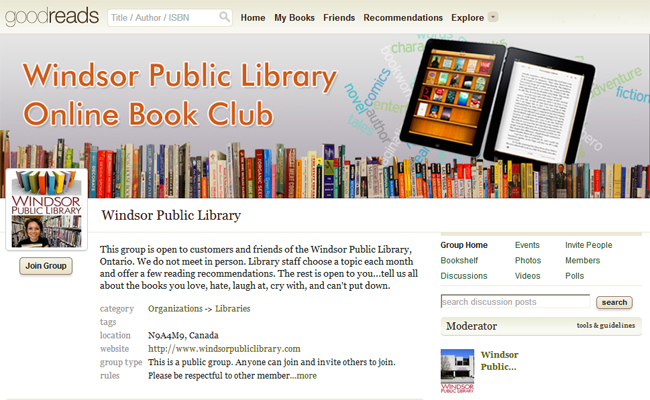 Every few weeks, updates and news about our GOODREADS Online Book Club will be posted to www.windsorpubliclibrary.com. There will also be tips on how to use the GOODREADS page so that you get the most out of your experience. To speak to us about GOODREADS, please call 519-255-6770, ext. 4424. Visit Windsor Public Library at www.windsorpubliclibrary.com and at the following sites: www.facebook.com/windsorpl twitter.com/windsorpublib; pinterest.com/windsorlibrary; and http://www.goodreads.com/group/show/104611-windsor-public-library.